I’m not a person who plays a lot of board games (the flashy ones on the screen are more my forte). So when I try to compare the game that we’ve been creating in class to another board game title, the effort is completely lost on me. With a furrowed brow, I typed the words into google: “grid based exploration board games”; nothing like what we had created came up. 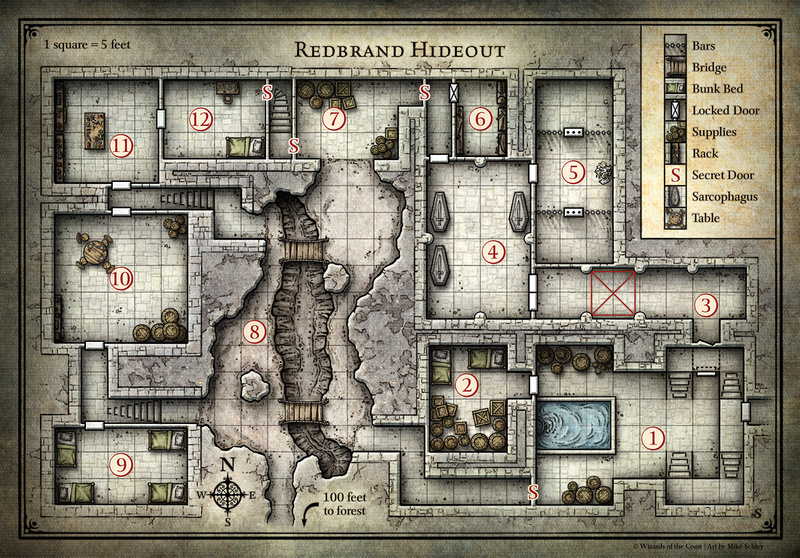 Example of a D&D Dungeon map. Note the grid which scales to approximately 5 metres of space. Players have usually the ability to move up to 30 metres in one turn and can utilize these squares to measure distance and location. Our game draws from many different elements of many different games. Having played a lot of D&D previously we were used to games that utilised a grid-based movement system and a turn-based action structure. We chose to make our game a collaborative one, rather than competitive, where the players work together to achieve their goal, resulting in the need for communication and strategy amongst their team mates so they do not lose. This draws inspiration from European games which focus on avoiding direct conflict with other players, which can usually result in some heightened tensions among friends. We decided to avoid this. A set amount of points are granted per turn, or as bonuses throughout the game per random elements of chance encounters. Using an action card will cost the player 2 points. Players are also able to save points for another turn if they want to, so if a player decides they want to attack more than once, they will need to have saved up some extra action cards to do so. The game works based on a capture-the-flag (the flag being the crashed ship, the base being… the base) objective format, however there are incentives throughout the game (eg, supply caches, or avoiding obstacles) which will divert the players. There are 5 character types in the game who all have their own ways of contributing to the team. The most important character, to keep alive, is the Navigator. Without this character, your team will almost definitely get lost, never find the crashed ship, and die – resulting in a loss. The other characters – Medic, Engineer, Military vet, and the Harvester – provide the team with the ability to fight, heal, repair equipment, and forage for food and supplies. If players are unable to progress, ie, running out of food, or starving, they also lose. As fuel is consumed with every movement, being careless with your moves will result in certain death. Each turn a dice roll takes place to place random encounters, obstacles, or advantages on the board. This element of randomness ensures that each game and each strategy will never be the same for each play through. There is also the chance that the odds may be stacked heavily against the players, giving them an impossible run, or making the game too easy if the players are exceedingly lucky. Inspiration image of possible crash-site concept art. Not ours, of course.